We are researching high efficiency, low cost organic solar cells (dye sensitized or perovskite) replacing silicon based solar cells. Diagonal light will also generate electricity efficiently, so if you install it on the roof, the total amount of electricity will increase. Even with weak light such as reflected light from the ground or diffused light in cloudy weather, electricity generation is possible. 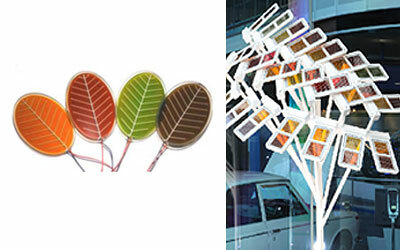 Moreover, it generates electricity with high efficiency even with weak light such as indoor lighting. For dye sensitized solar cells, light can be transmitted by changing the size of titanium oxide particles used for the photo electrode. In this case, power generation efficiency will be reduced, but by combining it with sensitizing dyes of various color tones, electricity can be generated while using light like stained glass. Processing at high temperature and high vacuum are not required during manufacturing, so less energy is required for manufacturing. 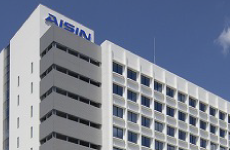 It is also possible to produce a lightweight and flexible battery using a resin film as a substrate. For dye sensitized solar cells, we are focusing on the design and synthesis of dye materials that absorb a wide range of light from short wavelengths to long wavelengths and developing solar cell to maximize the performance of dyes that generate power efficiently. In addition, from the viewpoint of prevention of leakage of electrolyte solution, we are also developing solidified electrolyte. The sensitizing dye absorbs light and releases the excited electrons to the titanium oxide on the transparent electrode. The electron is transferred through the transparent light electrodes to counter electrodes. 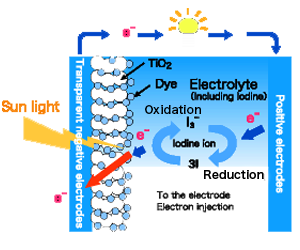 The electron is then transferred back through reduction and oxidation of Iodine in an electrolyte. For perovskite type solar cells, we are conducting R&D on high efficient, high durability and inexpensive hole transport materials based on dye synthesis technology. 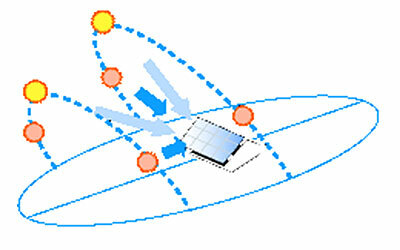 We are also promoting construction methods and material development for large scale solar cells. 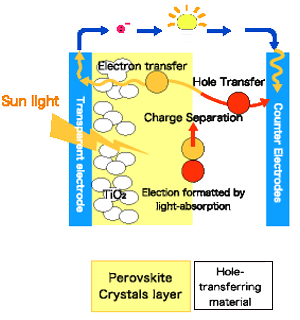 Light-absorbing layer(perovskite crystals) absorb sun light and form excitons. Electrons are transferred to counter electrodes through transparent electrodes. The transferred electrons then bind with the holes.